My daughter loves to have Bible stories read to her each night. We have a favourite Bible that we read from each night. While we love to read stories directly from the Bible they can sometimes be difficult to understand so we will often search out stories from the Bible that are geared more toward children. 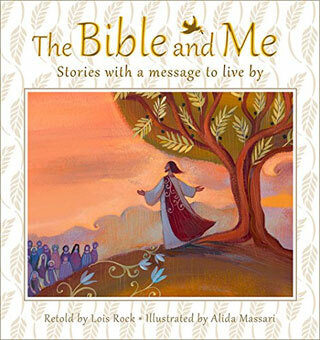 “The Bible and Me – Stories with a message to live by” is a wonderful retelling of faith stories from the Bible. The book starts in Genesis, chapters 1 and 2, with the story of “In the Beginning” and ends in Revelation with “The new Jerusalem”. The book shares with your child the story of God’s good news and his unfailing love for each of us. The illustrator, Alida Massari, has done a beautiful job interpreting each story. Many of the stories in the Bible are scary and often the images that go with them are scarier. The illustrations she has created are beautiful and calming. She has made excellent choices in the way she has depicted each one, perfectly drawing each image so that they are suitable for children. “The Bible and Me” is written for children ages 5-8, but I believe that older children would like this book as well. The text is sometime difficult to read, but that only because they use the old Biblical names and terms like Nebuchadnezzar and covenant. The length of each story is perfect for young readers. Each story begins with a verse of scripture from the “Good News Bible” and ends with a prayer, psalm, or passage for reflection. “The Bible and Me” isn’t a replacement for a Bible, but it is a beautiful retelling of many of the Old and New Testament stories of faith, hope and love. For more information visit “The Bible and Me” on Kregel publishing. Disclosure: I received a complimentary copy of “The Bible and Me” from Kregel publishing in exchange for my review. All opinions are 100% my own.